You are here: Home / Knowledge / Guidance / Dirty Shower Heads Could Be Deadly! Dirty Shower Heads Could Be Deadly! There is nothing quite like a steaming-hot shower to perk you up in the morning or to leave you feeling refreshed last thing at night. But if you thought your shower was a clean and safe haven of tranquillity, think again. Chances are, it could be a breeding ground for deadly bacteria and you may not even realise it. Experts at Manchester University have conducted studies into the condition of the inside of showers – and it doesn’t make for pleasant reading. Water coming from these shower heads could potentially harbour more bacteria than you’d find in the average toilet. What can you do to limit the chance of encountering these bacteria and fungi? It is suggested that you loosely tie a plastic bag around the shower head so as to limit the creation of a spray or aerosol, lie the head flat on the base of the shower or bath, then turn on the shower and run water through it for a few minutes before using it. This can help to flush out anything that might be lurking in the shower head and on the inside of the pipes. Additionally, you should clean your shower and shower head regularly. This doesn’t just mean the parts you can see. It also means dismantling your shower head and cleaning it both inside and out with a recognised product to help combat any scale, debris or bacteria that may be lurking unseen inside the shower system itself. Before use, carefully flushing the shower through with hot water can also help. Bacteria such as legionella will multiply in temperatures between 20 and 45 degrees Celsius, but is killed once the temperature goes above 60 degrees Celsius. Furthermore, if you have been away on holiday, run your shower for a few minutes before using it. This will help to get rid of any build-up of bacteria that may have developed while you were away. Few people would expect an innocent shower would pose such a risk to the health of those using it. 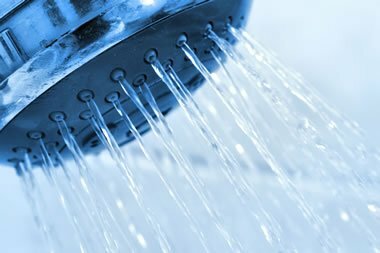 While infection rates tend to be low, it makes sense to keep your shower nice and clean – particularly if you have recently been ill, or are more prone to infection for some reason. For example, if you have a lung or skin condition, it may potentially be made worse if you encounter a water source that is not as clean as it should be. It’s also worth remembering that for certain people, especially those receiving treatment in hospitals, infection can sometimes be much more serious, and even life-threatening. As you can see, keeping your shower clean could mean the difference between good health and bad… don’t get caught out.